Activist investors have sent shockwaves through corporations as they tirelessly target individual directors and executives at some of the world’s largest companies. No longer satisfied with operating on the fringes of business, they are now a firm fixture in the boardroom. 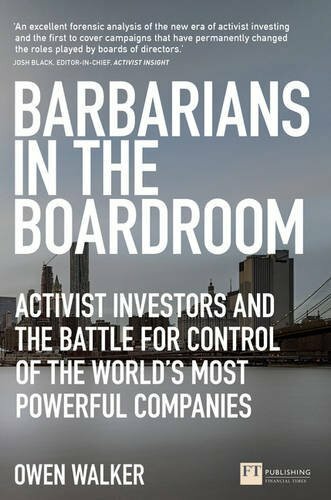 Barbarians in the Boardroom tells a captivating story of boardroom battles, discarded CEOs and ever more adventurous activists. Chronicling many of the foremost C-suite campaigns of recent years, it profiles and interviews the steadfast protagonists and tenacious mavericks from investor campaigns as diverse as Microsoft, Yahoo, Hewlett-Packard, Walgreens Boots, DuPont, Allergan, Alliance Trust and Darden Restaurants. Exposing what it is that activists typically demand from target companies and how they make them bend to their will, award-winning journalist Owen Walker reveals how some of the world’s largest companies fared when pursued by activists and discloses the sometimes startling and unintended outcomes once the hostilities are over.